The Tree of Life*Or L’Simcha Synagogue community is apparently split regarding a potential visit today by U.S. President Donald Trump after a gunman killed 11 people and injured six others, including four responding law-enforcement officers, during a brit milah (“baby naming”) at the Pittsburgh house of worship on Shabbat. 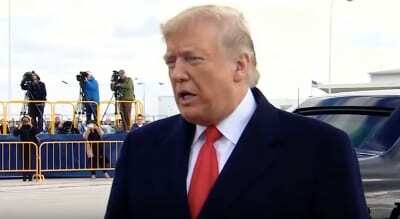 U.S. President Donald Trump speaks to reporters before heading to an event in Indianapolis regarding the shooting at the Tree of Life Synagogue in Pittsburgh, Pa., calling it an “anti-Semitic crime.” Credit: Screenshot. The gunman also targeted other services happening simultaneously inside the building, located in the heavily Jewish neighbourhood of Squirrel Hill. “I think whether or not the president comes is a decision that should be made by those closest to the victims and the three congregations attacked,” Joel Mackler, who grew up in Squirrel Hill, told JNS. A Jewish Squirrel Hill native, who requested anonymity for privacy reasons, told JNS that whether the president visits is not as big an issue compared to the need to appoint the State Department’s point person on issues related to anti-Semitism. In September, the U.S. House of Representatives overwhelmingly passed a bipartisan bill by a vote of 393-2 that would elevate the State Department official who deals with the issue of anti-Semitism from envoy to ambassador. A Senate version is pending. Were the bill to become law, the president would be required to fill the position within 90 days. “This would show the victims’ families and the community as a whole that the administration is taking action towards ensuring national policy implementation that will hopefully prevent future attacks and promote diversity in our country once again,” added the native. “I do not welcome this president to my city,” Lynnette Lederman, a former synagogue president, told CNN on Monday morning. The Pittsburgh affiliate of the left-wing organization Bend the Arc: Jewish Action echoed Lederman’s sentiment in an open letter to Trump.